So I thought it was about time I treated you all to another update. The last couple weeks have seen a few events around here. The big news I guess is that we are expecting a new life at the smallholding this summer, but of the human variety. We’re having our second (and dare I say final) baby in August. Although we are very happy about this it does have it’s downside. I now can’t lift, carry, pull and push the weights I could, which is what we really need me doing to catch up on all our jobs. In addition I don’t do pregnancy very well, my hips were really bad last time and 1st trimester nausea hits me hard. Nonetheless it’s only 9 months and we will get through it. We’ve had a little issue with the sheep. Starting back in Jan when they really upped the hay intake I noticed a bald patch on two of the ram lamb’s noses. As time went on it grew and got a little scab. Nothing on Crichton’s nose though. Then the a couple of the ewes got the same thing. I spoke to the vet who asked for pictures and was a bit baffled. She suggested it could be a bacterial infection where they are rubbing noses on the hay rack. We gave a long acting antibiotic and sprayed their noses blue. Sure enough the next day there was pretty much no sign of the blue spray and when watched they do rub their noses in those exact spots when eating from the rack. 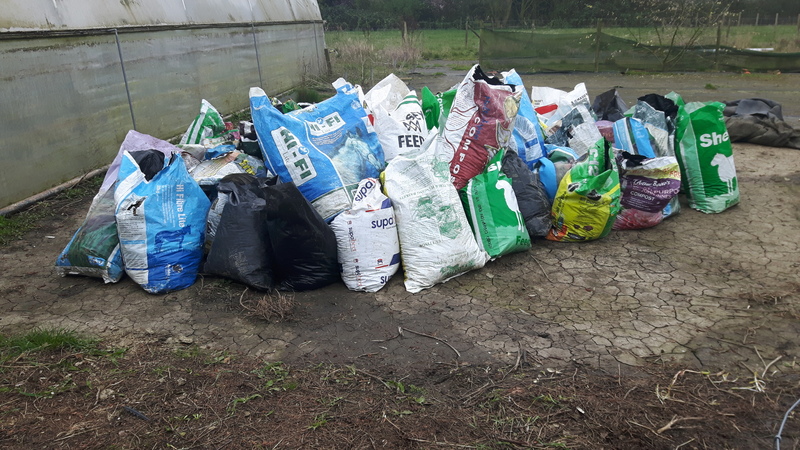 Not sure what we can do to stop it but we are moving them to some fresh grass soon and I keep hoping the grass will start growing again! If anyone has any ideas on stopping them rubbing their noses it’d be much appreciated! The next event we had was the Beast from the East. We actually got off quite lightly in terms of the weather. We had a couple of days of the weather being bitterly cold but at most we only had about 3 inches of snow. We saw worse snow when we lived in Scotland. The big issue we had was with freezing water buckets, but I think a lot of smallholders faced similar issues. Our remedy was to have spare buckets and fill them up in the bathtub. Then once in the morning and once in the evening we’d take the fresh warm water out and bring the solid buckets of ice in for thawing and refilling. Sam had to do most of the traipsing around in the snow as my hips were really bad that week. I did get out once to see to the animals and take some photos though. Chi also got a trip out in the sledge but I did have to take a crutch with me for that one! She was enjoying this, honest! I’m happy to say that we had no cold related animal losses. Despite Awen (one of the original Cream Legbar hens) looking pretty rough since autumn 2016 she is still happily scratching in the garden, on the wrong side of the fence might I add! Despite that we did have one guest hen for the cold snap. Two days before the snow hit, Sam found Burnham (one of the Rhode Island Red hens) just sitting in the nest box, he had to move her to change the bedding but she hobbled and flapped her way around then lay down. It didn’t look very good at all. I gave her a once over whilst Sam saw to the rest of the animals. Wing seemed fine. The scaly part of her leg was as cool as the other side, the feathered part was as warm on the other side. Nothing felt floppy, at the joint or within the bone, and she could grip my finger with her toes. I used some warm water and a cloth to wash away the caked on mud from her foot in case she had something stuck or a cut, but there was nothing I could see. Her leg was shaking like anything but the rest of her was fine. Her comb was nice and red, her eyes bright and she didn’t feel skinny. She was also eating and drinking well when food was brought near. We brought her in in a dog crate and crossed out fingers that it was just a sprain. I called the Vet the next day for some advice and she suggested tissue damage or possibly Mareks. There’s a good page about it here if you want some more information. The vet said we were right to bring her in and confine her, if it is Mareks she will go further downhill, if it isn’t then the rest should help her. From what I can see from that page it would be the neurological form, but the leg wasn’t really paralysed so much as she didn’t want to put weight on it. We put her out the next day as I was worried about her in the warm house all day on her own (we were going to be out) but when we got back she was lying in the same spot. We then kept her in for about 4 days before giving her a bit of a stretch in the conservatory. She hadn’t been laying but she had new feathers coming in on her clipped wing so she may be moulting a little. I had a feel but couldn’t feel anything like an egg so I suspect the stress of being ill or moulting has her off lay for a bit. She was much better in the conservatory, a limp for sure but no longer flapping her wings with every step. A few days later she started getting much more lively in the pen. Arguing with me when I lifted her out to clean the cage and making much more noise. We had lost all the snow in the garden and it was sunny enough that some chickens were sunbathing so I popped her out. I kept an eye on her throughout the day. She was still limping, but not really hobbling. She didn’t run around the garden but she did move about and seemed happier. In the evening she took herself to bed, although she slept on the floor of the house rather than on a perch. She’s been out a few days now and we haven’t seen her lying down exhausted once. She is still limping but she is a fast mover when she is out with the corn and there’s no signs of any of the other hens bullying her. It is possible she will now always have a limp but her spirits are high so I’m feeling pretty happy about it. The last bit of news is really non-news. We still don’t have goose eggs. I’m starting to be convinced that we have a gay couple of geese, they are certainly bonded, going everywhere together and leaving the 3rd goose on its own a lot of the time, but neither one is being submissive in the mating situation. They get into the water, make all the mating sounds then run in circles pulling at the feathers on each other’s backs until one gets pushed out of the pool. Then they both flap like mad. I was hoping the third was a female at least but no sign of eggs or a nest and it is much later than when the previous generation of geese started laying. Maybe it’s just the cold snap. I’ll keep holding out hope. I mentioned in my last post that we had our first gosling and were hoping for the other two to hatch in the next few days. We also had 4 new eggs appear in the nest. Unfortunately when Sam next checked one egg was sitting outside of the nest. We thought it might be a dead egg so I went to collect it for candling. It had gone and we assumed that the goose had taken it back under her. We waited and waited but no other goslings appeared. Then we went out a few days after the expected hatch day and saw all of the geese out with the gosling. I approached the nest but there was no reaction from the geese. A bit of digging revealed 4 eggs but no markings on any of them. The other two eggs that I had set were gone. We can only assume that they weren’t viable and the geese got rid of them. Where to though I have no idea, we searched the area top and bottom but no signs, not even any shells. April looked quite awful but later that day she was sitting again on the eggs. As far as I could work out the new eggs were just over a week old by this point, we couldn’t let her sit for 4 more weeks, she was losing the energy to even threaten me when I approached the nest. The decision was made and we took the eggs away. 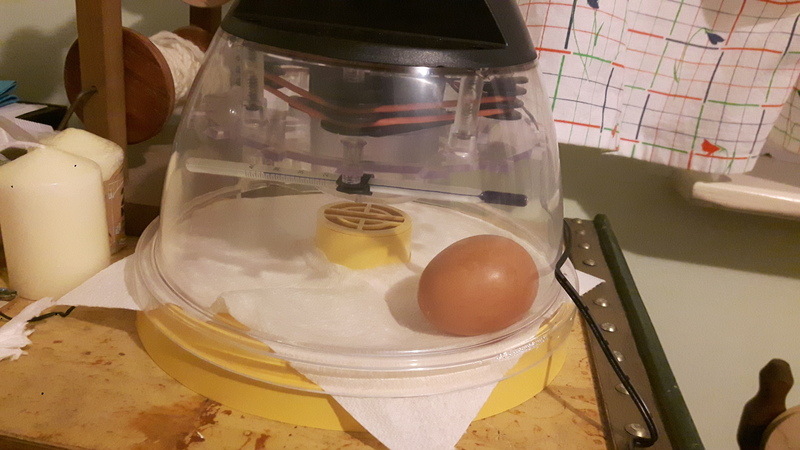 We have an incubator that we bought as a back up in case any chickens got bored of sitting halfway through a brood, it made no mention of goose eggs though and looks quite small. We decided to risk it and try and fit in as many of the eggs as we could. We were very happy to discover that we can in fact get 4 goose eggs into a Brinsea Mini Eco! 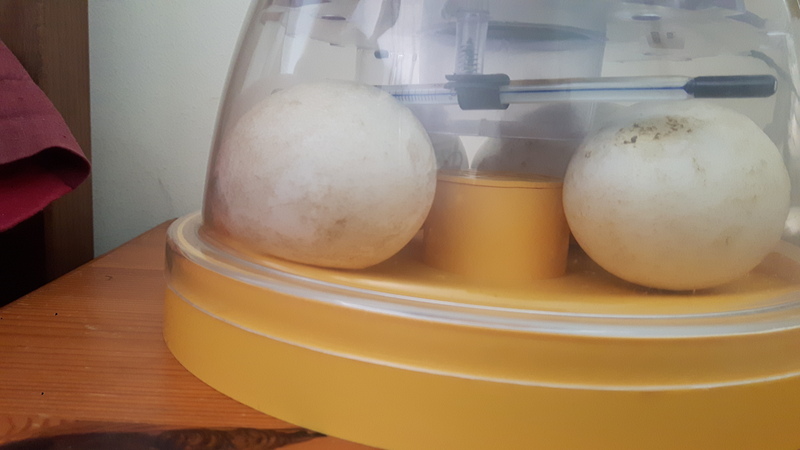 There are no instructions with the incubator for goose eggs, no automatic turner and no way to monitor humidity so we are absolutely winging it here, but we wanted to give the 4 eggs a chance. We are trying to turn them 4 times a day and going with the instructions for chickens on humidity. We candled the eggs last night and saw movement in 3 of them, the 4th one doesn’t look promising but I’ll check again in a few days. I’ve no idea if this hatch will be successful but it’s worth a try. If anyone has tips on hatching goose eggs in an incubator I’d be very welcome of them! On an even better news front, our first gosling is doing well. It wanders around with its 4 bodyguards. I was worried about the crows getting to it, but it is one well protected gosling! Time to talk about something other than the sheep! 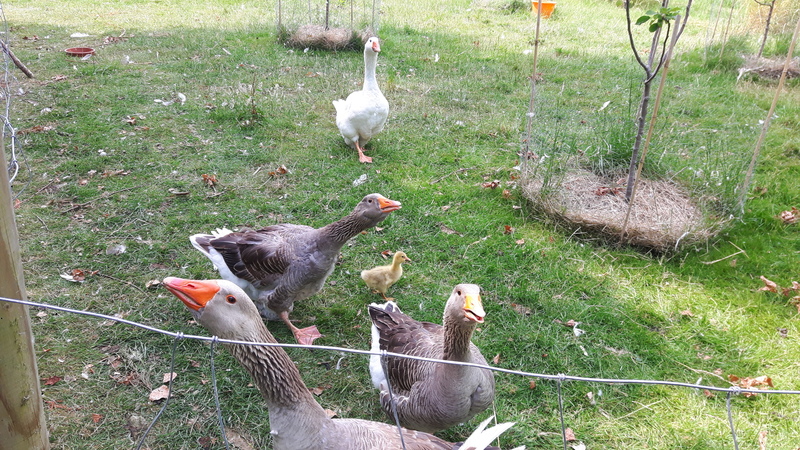 The geese are doing well and we are expecting our first goslings on Thursday. We had 3 eggs under April and she was sitting really well but last Thursday I could have sworn it was her rather than Abigail off the nest. The next day I was certain and Sam checked to see that there was indeed a goose on the nest. It turns out Abigail and April have swapped. I don’t know if April was getting worn out and Abigail stepped in (April wasn’t in the best condition to start but we just could not break her broodiness). 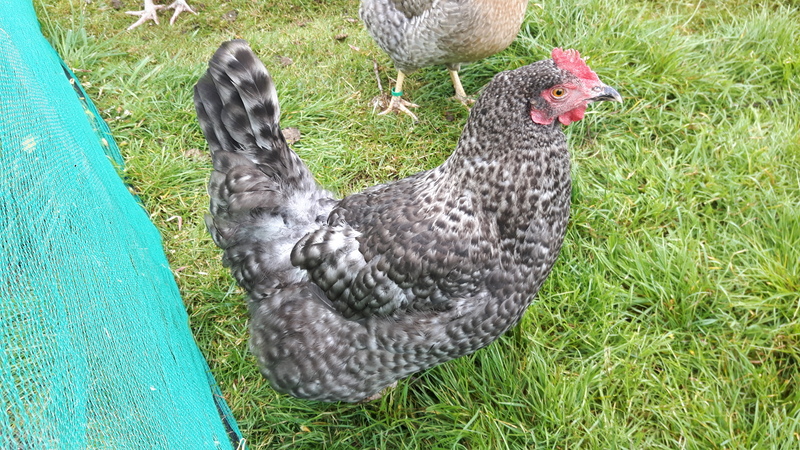 Or it could be that as we are getting close to hatching day the eggs have made Abigail go a bit broody too. Either way when I looked again on Saturday April was back on and Abigail was off. On Monday evening we got a surprise, a little gosling running around outside with April, Barbara and Athos. Abigail was sitting on the nest still. Two mums are better than one right? When I finally got a peek at the nest today there were 6 eggs under April. It would seem that Abigail was sitting on the nest to lay eggs. Unfortunately, we have no way of knowing which are the new eggs and which are the old ones with soon to hatch chicks. I think we will wait until the end of the week then try to candle to work out what is going on. We may have to take away the newer eggs to stop April from running herself into the ground sitting. It’s the season for broodiness and Alice, one of our Brown Marsh Daisy hens. went broody 4 weeks ago. We popped 2 eggs from our Cream Legbar hens, 2 eggs from our Cuckoo Maran hens and 2 eggs from Brienne (a hybrid) under her. All fathered by Aramis of course. We candled the week before they were due and all 6 eggs were fertile and developing well – go Aramis! Friday before last we spotted 2 chicks. One from a Cream Legbar egg and the other from a Brienne egg. 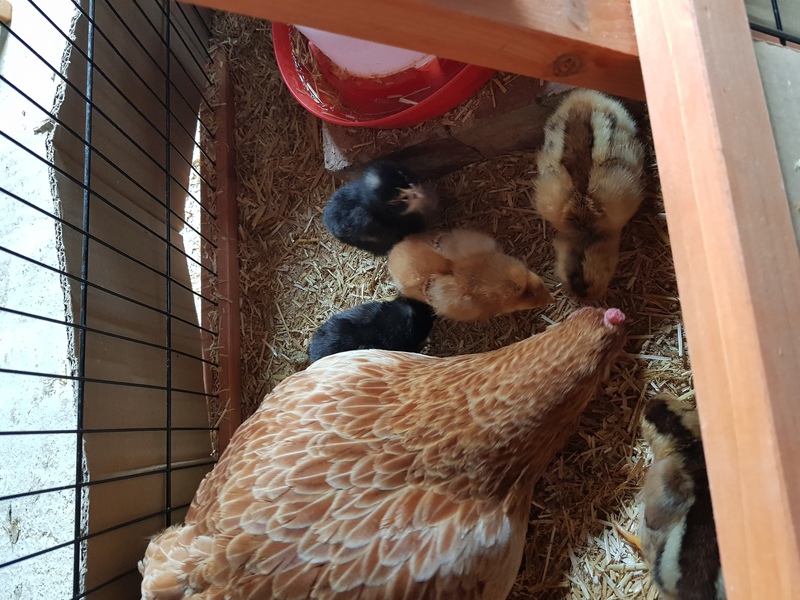 The next day when Alice got off the nest there were two more slightly damp chicks and 2 eggs under her, another Cream Legbar egg and a Cuckoo Maran egg had hatched. She had a poop stretched her legs and I removed the old egg shells. She went back into the nest box and sat on eggs and chicks, I figured all was fine. Unfortunately, when we went out 3 hours later it turned out she had left the remaining two eggs, they were cold. It could have been from me removing the shells but it may also have been the older chicks being 2 days old now and running about. We had a similar thing happen last year and we lost those two eggs. We bought an incubator as a back up after that. We dug the incubator out and got the two, now very cold eggs, inside. As I put the eggs in I saw that there was a large bit of shell missing from the underneath of the Brienne egg. You could see the chick’s back and there was no movement at all. I put the remaining Cuckoo Maran egg into the incubator and slowly peeled off the shell of the Brienne egg. There was a fully formed, ready to hatch (yolk sack completely absorbed) chick inside but no movement at all, even on the eye. The only thing I can think is that Alice either stepped on it as she left the nest or crushed it slightly while sitting. As it has been so hot she removed all the bedding from around the eggs and had them on the base of the broody coop. I waited patiently for the Cuckoo Maran egg to show any sign of hatch and my hopes dwindled. They were restored two days after we popped the chick in when I saw a small crack in the egg. It was pipping! We were away during the day and when we got back a bit more of the shell had been cracked open. We kept checking that evening but nothing. The next morning I heard a cheep and I cheeped back, it got very excited, cheeped at me and rolled the egg! We managed to actually be there for the hatching which was amazing to watch and we got a video so you can watch too. 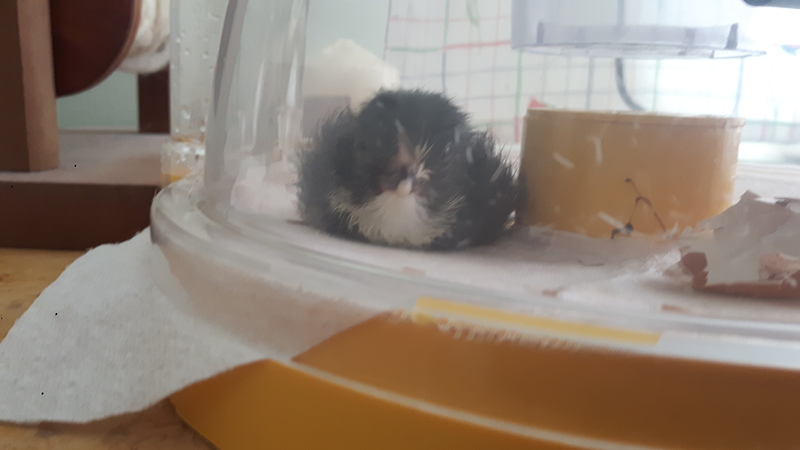 We let the chick dry off, and gave some crumb and water in the incubator. It was 3 days younger than any of the other chicks but we decided to try and have Alice raise it. We went out after dusk the day it hatched and slipped it under. Sam waited to hear any sounds of Alice rejecting it but there was nothing. We left it and crossed everything we had. The next day we couldn’t see a chick, but we couldn’t see a body either which gave us some hope. Later that evening we finally saw the chick all fluffed up. The chicks all ran under Alice when I approached but when I spoke a little black one ran out, it had remembered my voice! It’s doing fine now, and although it’s a bit behind the others in development it’s still firmly one of the brood. As with the sheep it was another lesson in sitting on my hands and leaving nature to do its thing. If I had intervened too soon and ‘helped’ the chick hatch I could have ruptured blood vessels and caused it to bleed to death. Alice and her babies. The incubator chick is the black one with the small dot on its head. Just as we thought all the broodiness was coming to an end Brienne went broody. We decided this time to get some pure breed eggs to go under her. The Derbyshire Redcap is a British rare breed that is on the Priority list according to the Rare Breed Survival Trust. They are meant to be a good duel purpose breed and lay a good number of large white eggs. The only other white egg layer we have is Buffy and her eggs are on the small side. They also look very different to any of our hens. I had looked for some Derbyshire Redcap eggs when Alice went broody but I couldn’t find anyone selling them or adult birds. When I went searching for rare breed hatching eggs for Brienne I was very happy to find a listing for Derbyshire Redcap eggs, and not too far away so we didn’t have to worry about postage. We popped them in a new broody coop (needed something large enough for Brienne!) and she sat immediately and has been quite rooted. I do hope she makes a good mum. We will miss her monster eggs though! It also turned out that the breeder had some pullets for sale. We have been running out of selling eggs quite quickly. When we first started we liked to have 4 boxes of eggs on the gate. We even got a back log a few times and took selling eggs into our own usage. Now we are struggling to keep even 1 box in stock and quite often a box is gone within half an hour of me putting it out. People had said we should advertise on the main road, and I did make a sign but we are selling out without it! It is great but I also hate disappointing people and we certainly have room for more hens. We would have liked POL hens, but finding POL rare breed hens that haven’t been vaccinated seems to be ridiculously hard. I have been searching and searching and finding very little. These pullets are only 17 weeks old so a few weeks off laying still but they should help us out. We bought 3 and haven’t given them any names yet. They are quite skittish at the moment but I am hoping they will settle down. Right the thread title promised birds and bees. Weekend before last we went to the Rutland show, as a day trip out but also to scout it out as a potential place to show our sheep in future. It was a great day out and at the end we stumbled past a ‘bee tent’. The Leicestershire and Rutland Bee Keepers Association were there and they literally had a tent full of bees. They had suits for people to put on and go and have a bee experience. We have been very keen on the idea of bees, they would be great for increasing our pollination, provide us with some honey (possibly for mead) and would do our bit to help out the bees. We even bought a bunch of second hand equipment from some smallholders who were selling up last year. We have been a bit nervous though as Sam doesn’t think he would have the balance to work with the bees and I wasn’t sure if I would have a panic attack being cooped up in a suit and surrounded by flying things. It was the end of the day and we were all tired but I couldn’t walk past this opportunity so in I went. It was brilliant. 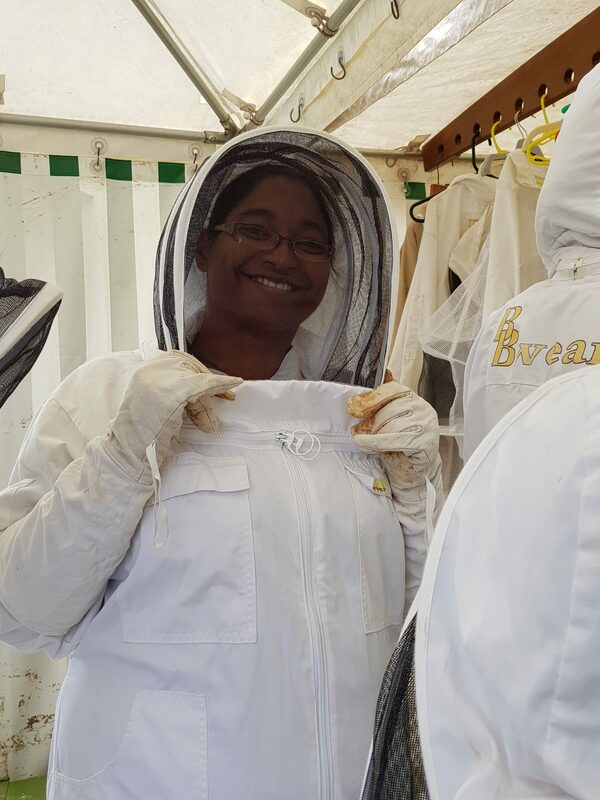 I was very nervous to start with but I found the suit reassuring and felt surprisingly calm in with the bees. It was great getting to see a hive up close and be hands on. It wasn’t a full hive but it was a still a good experience, exactly what I needed to make me think more seriously about courses and our local bee keepers association. The only worry I have now (other than swarms) is how heavy the hives can get when full. My back is such a weak point on me that I’m worried I would have trouble lifting things. It’s still worth further investigation though, I’m over my first hurdle in the journey to beekeeping! Right I think that is enough waffling for today. Should be some posts on blade shearing and what we are getting up growing fruit and veg soon. If there’s anything you would particularly like to read about from the smallholding then just leave a comment and I’ll do my best to do a blog post on it. I’m a bit late posting this but there’s nothing new about that! Following from our weekend of the unexpected we decided to set some of our plans in motion and went for a non-stop Monday of Musical Animals. We had our good friend Lis over, but just for the day and the vet booked in. It ended up being such a busy day that I didn’t take any pictures of us doing bits, but I’ve managed to go around and take a few snaps in the following week. Lis arrived the Sunday night, with another one of our good friends, Kay. 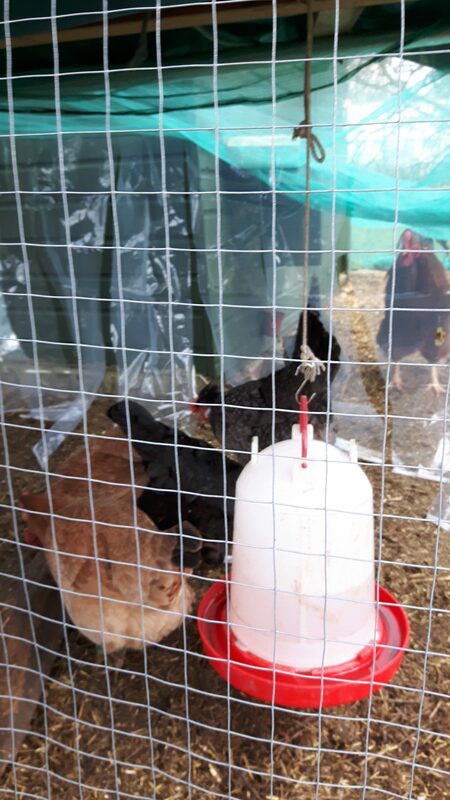 We decided to put their presence to good use and set above adding 4 more chickens to our flock. We actually bought them 10 days prior, but they have been in quarantine. 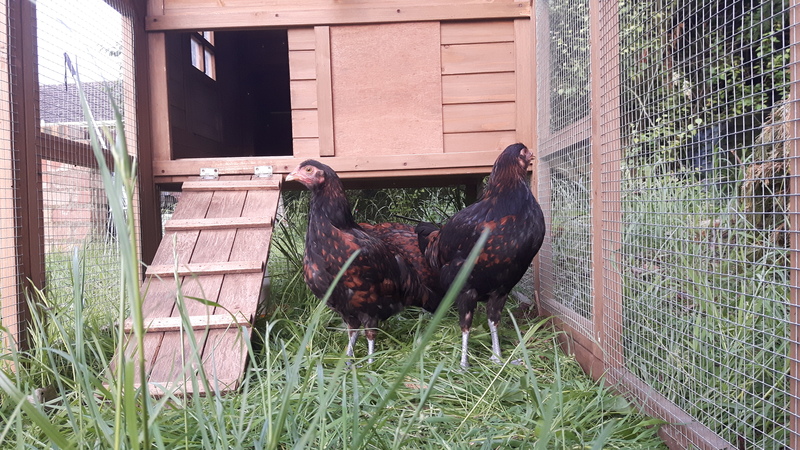 We now have another 2 Cream Legbars (although these do meet the breed standard so look quite different to Annie and Awen) and 2 Cuckoo Marans. The Cuckoo Marans aren’t a rare breed but I do like the brown eggs that they lay and they are a nice meaty bird so we made an exception. The eggs are a bit lighter than I was hoping for, but they do seem to vary in colour from day to day. We waited until the birds had gone to bed and were sleepy then removed them one by one and added a green leg band to one of each breed, just so we can tell them apart. Their wings had already been clipped by the breeder. As we have the girls free ranging we like to clip their wings for the first season here. Once they know that this is home we leave them unclipped. We then moved the new girls (still to be named) into the main chicken house. They should all wake up together and between the large space they have and Aramis’ policing there should be a fairly peaceful merger between the two groups. We kept checking regularly for the next day or so, ready to separate if any issues, but there was no need. We also did a head count for the first couple of nights in case they didn’t find their way back to the house but they were all there. A lot of things I’ve read has said to keep the chickens penned up but visible to each other for a week prior to introductions but we haven’t seemed to need this with our set up. There’s the odd squabble around the feeder or at corn time but we’ve not had any injuries with new introductions and this time was much the same. I do put it down to a combination of the space and Aramis’ presence. Monday morning saw the vet here bright and early. The first stop was the geese. I have been worried about April for quite a while now. 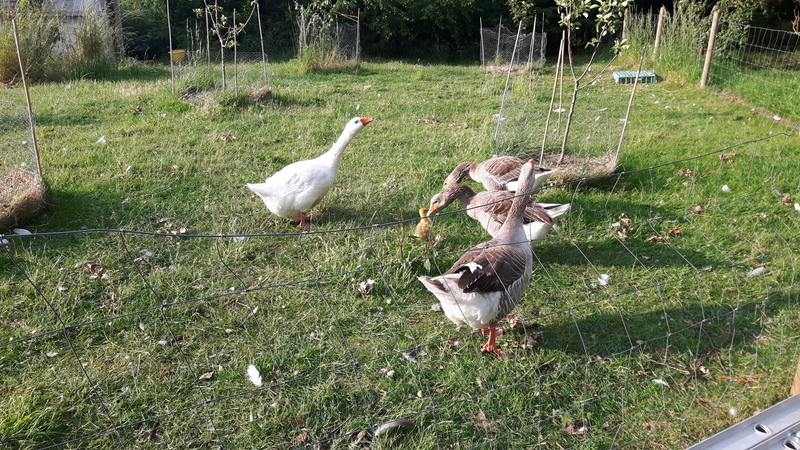 The geese don’t take the wormer very well (they very rarely eat as much of the pellets as we would expect them too) and the vet wasn’t really sure what else we could worm them with. April also has this odd protrusion on her chest, which I had thought was her keel showing through. It turns out it’s not her keel but rather her crop and it is likely showing due to her being a bit underweight. I’m not really all that sure what we can do about that as we give corn but if we give too much they just leave it and we offer pellets but they don’t eat those either. We try and make sure they have plenty of grass but obviously something is stopping her putting as much weight on. 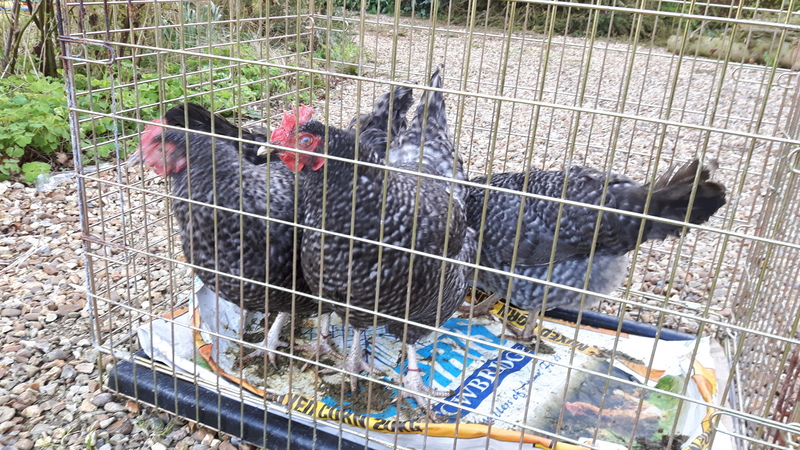 She did have a slightly mucky bum when she came out of the bird flu quarantine but that has cleared up. The vet said if she was looking at her she wouldn’t be too bothered and if the bum gets mucky again we can check for coccidia (a parasite), but otherwise she wouldn’t worry. That was a bit of a weight off my shoulders. I’m still not sure I’m happy for her to sit on eggs (April gets very broody) but that’s no longer an issue as when we last pushed her off the nest to eat she decided to stop laying completely. We’ve had no eggs for over a week now so I’m starting to think she has stopped for the season, which is a bit of a disappointment but hopefully she will put some condition on and be ready for a good breeding season next year. So now we are down to just Barbara laying eggs. 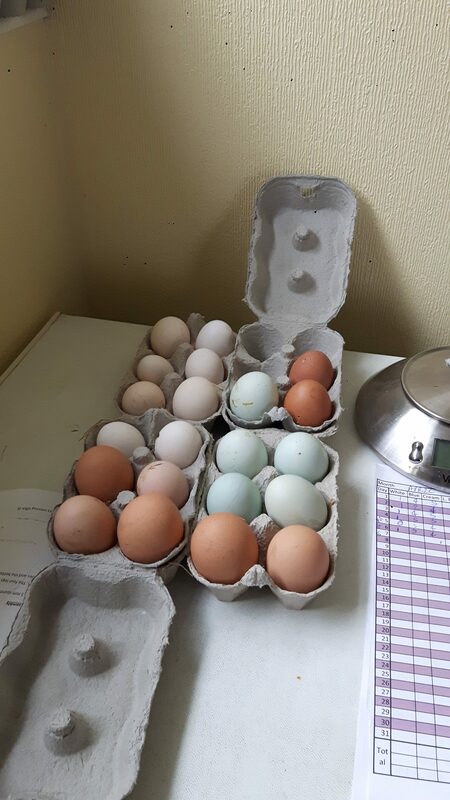 Which I suppose is a bit of a blessing as we have had absolutely no interest in goose eggs at the farm gate stall. Next up was the sheep. 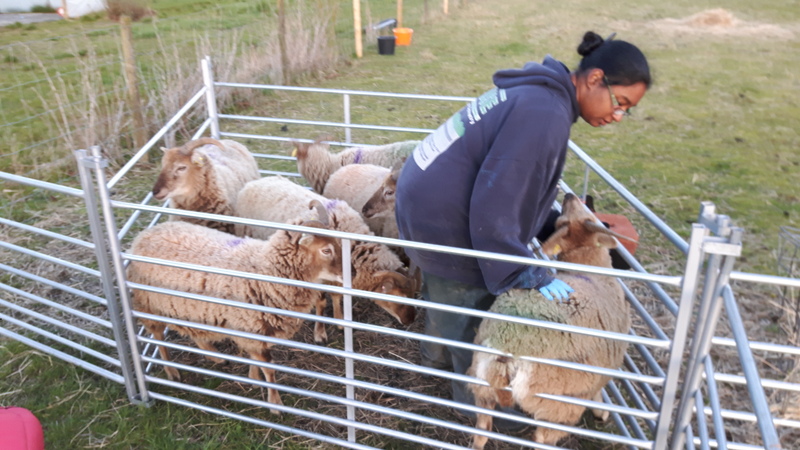 We gave everyone a white wormer as I saw Nematodirus eggs in my faecal egg count, and they all got their Heptavac vaccinations which will give protection to their lambs. She had a quick look at Aeryn’s feet and suggested a little more trimming and to keep an eye on them. Anya’s feet also needed a little trim. Other than that they all seemed fine and had a BCS of about 2.5. We waved the vet off and then got to work. First job was to release the geese. They had been penned up for the past 10 days so that there was less grass to eat, that should, in theory, make them more likely to eat the worming pellets. They still didn’t eat much but we couldn’t keep them penned forever. They were very happy to be free and had a good run up and down then dove into the grass. We set up the hurdles around the trees again and to cover their water and that will stay like that until the end of April when hopefully the restrictions will be relaxed. The rest of the hurdles went across the road to finish fencing off the 0.5acre we are trying to get under control. We have used heras panels for the rest of it but 2 hurdles make for an easy entry point and somewhere to hang the hay rack. The aim is Anya and Aelin will get this area under control whilst also no longer bothering the pregnant girls or eating up the good grass. Then later in the year it may be of use to the other girls and/or their lambs. Then it was time for the most daunting job of the day, getting Anya and Aelin across the road to their new home. I had ummed and ahhhed about how best to do this. I finally made a decision and I bought a halter. I figured we would walk them across with me holding onto the halter and them following Sam. The sheep have got so good at following Sam everywhere that I was hoping the halter would just be back up for us being on the road. It ended up being a bit of a disaster, likely because the sheep aren’t used to halters at all. We opened the hurdle, I let Anya out (she is the tamer of the two) and suddenly we were in a rodeo with Anya jumping and kicking and me hanging on the end of the halter. Thankfully it was probably less than a minute of this before I caught her up again and got her back in with Aelin, it felt like forever though. In the end we got the trailer out (not attached to the car), loaded the girls up really easily (have I mentioned that Sam is a sheep whisperer) and pushed the trailer across the road. The girls unloaded without looking back and have munched away in there ever since, barely batting an eyelid at us. In fact they have given us a few scares by hiding in the long grass. More hurdle and heras panel moving and we had the middle third of the sheep field ready for the pregnant girls. They saw the gate was open and meandered in and set to work on the grass, again no longer interested in us for nuts or hay, so I take it as a good thing. The hope is that they will stay on here until they start lambing, then spend a day or so inside and turn out onto some fresh grass we have set aside for after lambing. The pregnant girls, munching away. That was finally all the animals moved to where they needed to be. We headed in for a goose egg lunch (fried which is positively my favourite way to have goose eggs) and then it was time for Lis to go. Sad to see her leave as we hadn’t seen her in so long but she will be back for lambing time in May. Hopefully we won’t be too sleep deprived then. I think that is it for this post. We’ve been busy bunnies on the growing side of things so hopefully there will be a post on that soon. This weekend was full of unexpected turns of events. Firstly I was booked onto a spinning course on the Thursday so Sam took the day off to look after Chi. I have been wanting to get my spinning wheel back into use for ages so was really looking forward to this. I actually booked onto the course in Feb, but it was cancelled. Unfortunately, it was cancelled again at the last minute. We decided to make use of the day and got a bunch of tasks done. 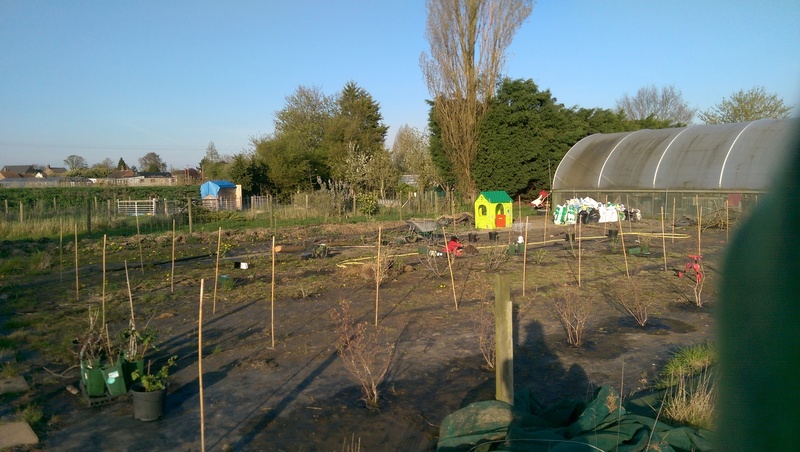 Another 12 berry bushes planted in the berry patch so we have gooseberries, red currants, white currants and blueberries planted. Still have the raspberries, loganberries and strawberries to go in but it is really starting to take shape. I am looking forward to many years picking berries in this patch. We also planted some onions in the outdoor veg patch, to go with the potatoes I planted earlier in the week. I need to get some more bits in those beds but I can see things starting to come together. We are facing a bit of a dilemma with where to do lambing. We were going to use our storage polytunnel but I am starting to worry about it getting too warm in there as we are lambing later in the year than I’d have liked. 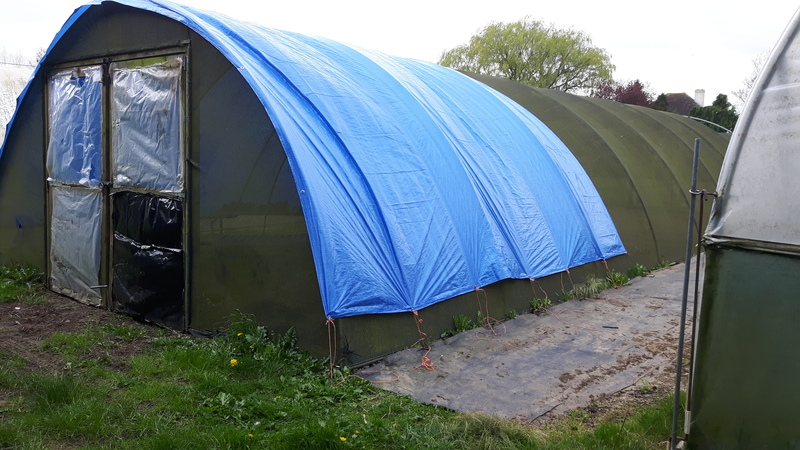 Sam had an idea to partially cover the shade tunnel using tarp so we gave that a go. A few false starts getting it on but we succeeded at last. So far it seems to be holding and not flapping so we may put a second one on to give a larger area. Lastly we cleared up some big thistles from the sheep field and filled in a few ankle breaker holes. Our ground can get so dry in summer that it actually cracks, leaving nice gaps that will fit a foot in! While we were in there we noticed that one of the sheep, Aeryn, who is pregnant with twins had a slight limp. Everything I have read has said it’s best at this stage to see if it resolves itself rather than trying to catch and see to a pregnant ewe. So we noted it and left her be. We were meant to be going away for the weekend to see Sam’s family in Dorset, including his grandmother, before lambing. We got up early on Friday morning to get all the animals cleaned out and sorted ready for the sitter coming that evening. I gave the sheep fresh hay but they were all sleepy and not bothered, as they are most mornings. After sorting the other animals I went back as an after thought to move their hay rack (3 hurdles in a triangle with hay racks over them that we move regularly), as there was some nice grass under it and we are moving them out of that area on Monday. It was then that I noticed that Aeryn had gone from a slight limp to completely non-weightbearing on one leg. Got Sam to come out, with ewe nuts, foot spray and foot shears. At first I thought I could just grab her but even on 3 legs Aeryn can be quite flighty. We got her penned easily enough though (Sam really is a sheep whisperer). We couldn’t turn her as she is 6 weeks off lambing but we were able to pick her feet up to have a look, a bit like a horse. The worst one was the front right. Really bad shelly hoof, to the extent that the whole external wall was flapping. There was also a slight smell coming from the foot. I cleaned the mud out of the gap and we clipped away the loose bits of hoof. and sprayed it. The other front foot had a bit of shelly hoof as did one of the back so they got the same treatment. We let her go and then had a chat with one of our friends, Cassie, who is a vet. She suspected foot rot, which would need antibiotics and painkillers as well as daily spraying, so we got in contact with our vets. The trip away would have to be cancelled. I don’t know if I have spoken out the vet situation on here but we have only 1 that covers our area. That wouldn’t be so bad but the practice is an hours drive from here so not ideal. It’s not all bleak as they have a half price call out day for our area once a week, are happy to post out meds and have an ‘outpost’ where you can arrange to pick meds up from if it is arranged in advance. The receptionist said that she would get a vet to call me back but we would need to come to the surgery to get the meds as there was no-one nearby. Not great but, as our plans had already changed, getting Aeryn sorted was the priority of the day. 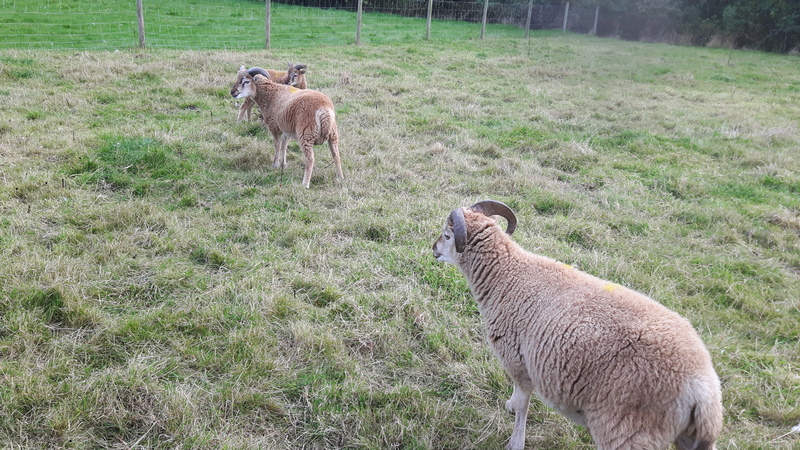 The vet called and was worried about Aeryn being off her feet for twin lamb disease (TLD) but although she was lying down a lot she was still eating and she was running over (albeit on 3 legs), when she saw Sam with ewe nuts. She also didn’t have the tell tale acetone smelling breath. So we weren’t too worried about TLD. TLD is a metabolic disease that can affect pregnant sheep. Basically, the lambs take so much nutrition that the ewe starts breaking down her own supplies, if this happens too much she can effectively get poisoned by the ketones and it can lead to death if not treated quickly. The vet was very nice and when he heard where we were he said he could actually meet us in a local supermarket car park to give us the meds, a 20 minute journey instead of an hour. Whilst I rushed off to Asda, Sam fixed the Honda (dead battery and relentless car alarm) and headed off to get some straw in case we needed to bring her in. We needed to get the straw anyway, ready for lambing, but thought we had a few weeks. I have to admit it felt very odd pulling up in the car park and standing next to the vet as he drew up the meds with shoppers driving past but it made things so much easier. Back home and we gave her the meds. There wasn’t much improvement at first but after a few hours she was limping less. We caught her the next morning and she seemed just as bad. I decided to check between her toes in case anything was stuck there. I had been so appalled by the state of her hoof that I hadn’t thought to check the day before. There was indeed a piece of hoof stuck diagonally between her toes. It could have broken off there as the hoof wall broke away or it could have been she stepped on it after I had clipped it. I’ll be picking up any hoof cuttings in future! She got another spray and release. By that evening she was looking a bit better thankfully. 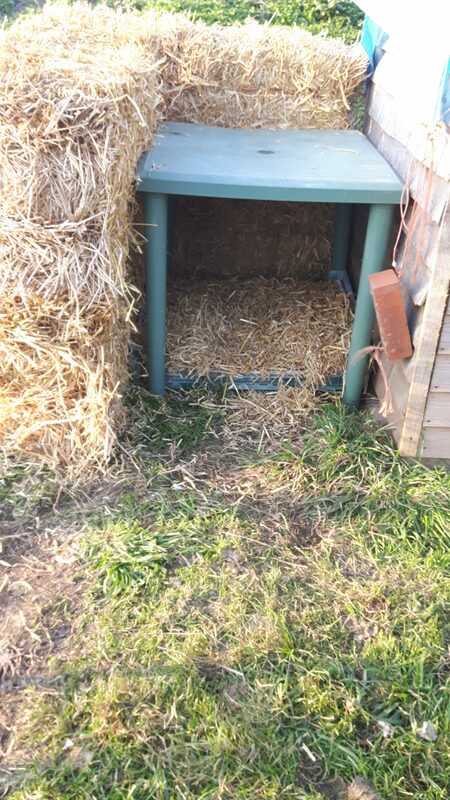 Now that we had a good store of straw we used 4 bales and an old garden table to make a goose nest box. April has been getting overly broody and sent poor Barbara out to nest in the dirt. We are hoping this impromptu nest box will give her somewhere dry and clean to lay. I was getting worried about April as she had spent 3 days on the nest without laying an egg and was no longer taking feed and water breaks so we pushed her off and locked her out. 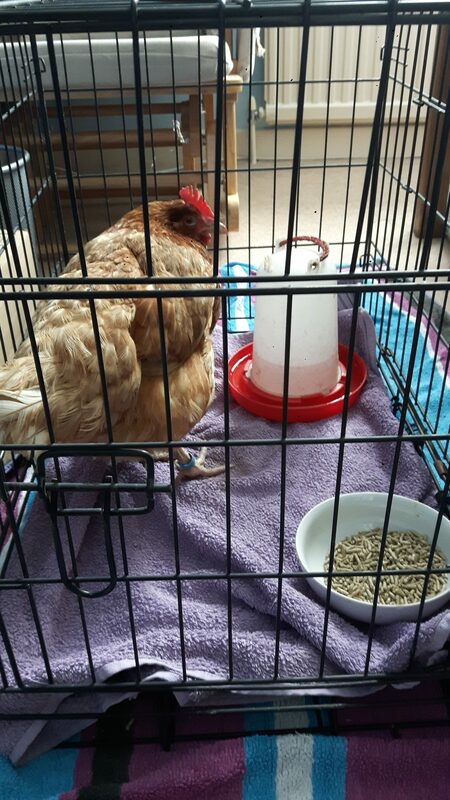 It seems to have broken her broodiness but she has also stopped laying *Sigh*. They are on the last couple days of worming so hopefully when we let them out on Monday she will come back in to lay. When we realised we weren’t going away for the weekend we made some impromptu plans for Sunday. We had been planning on taking Chi to a few places whilst away and as that wouldn’t happen we wanted to make it up to her (even though she didn’t know about them). We decided to go to Hamerton Zoo, which isn’t too far from us. We checked on Aeryn first and she was much improved, a bit of a limp, back to how she had been on Friday. We still penned her and sprayed the feet though. We had a lovely time at the zoo and when we got back and checked her again she was walking fine. If it wasn’t for the slightly blue legs and close scrutiny, you wouldn’t have known she had an issue so we didn’t give her the added stress of another catching. Hopefully this means it wasn’t foot rot, and just a secondary infection but we will remain vigilant. PS As always if you like the post, give us a thumbs up, and if you want to be notified of every blog post then suscribe – there’s a button to the left or below if you’re on a mobile device. Well this weekend it was Mother’s day and Sam’s birthday but that didn’t mean a restful weekend! It started on Friday evening when we caught up the sheep ready to move them to some fresh grass. We took the opportunity to do a body condition score (BCS) on them. This is basically feeling their backs over the hip area to assess how bony or fatty they are. This gives you an idea of how they are doing and what feeding they need. Especially Arya who we know is carrying twins as this can put quite a strain on her body. We also took some poo samples so we can check the worm burden of the sheep. Saturday wasn’t too bad, a trip to B&Q to pick up some supplies and had a quick lunch out so we could get straight to work at home. First job was a delivery of manure. I’m trying desperately to improve our soil so some free organic matter seems like a good bet. It’s horse manure though so a bit weedy but we don’t have cow manure in great quantities in this area. Next was the usual jobs around the holding, including cleaning out the chickens. We’ve been having a slight problem with mice. Our house is filled with lovely deep bed of chopped straw for the chickens to jump off the perches onto. Unfortunately, this winter mice have decided it’s a great place to live. First it was two nesting which we cleared out. Then about a month later we had a young family which we also cleared out. And now a month or so later we have had 1 in there which I cleared out Saturday. 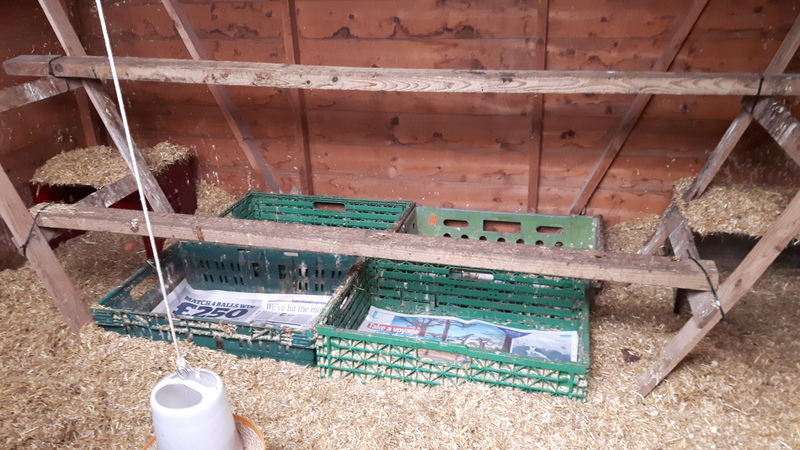 I basically move all the additional things in the hen house (plastic nest boxes and a wooden step for the hens to reach the higher nest boxes) and chase out the mice. It seems to work as they stay away for so long, but I think we need to look into some traps if it persists. Then I decided to brush off my very rusty skills to do a faecal egg count (FEC) on the samples we gathered on Friday. This tells us what eggs are being shed by the ewes and if they need worming. It was a nice low count of about 150 eggs per gram (epg), which wouldn’t be anything to worry about. 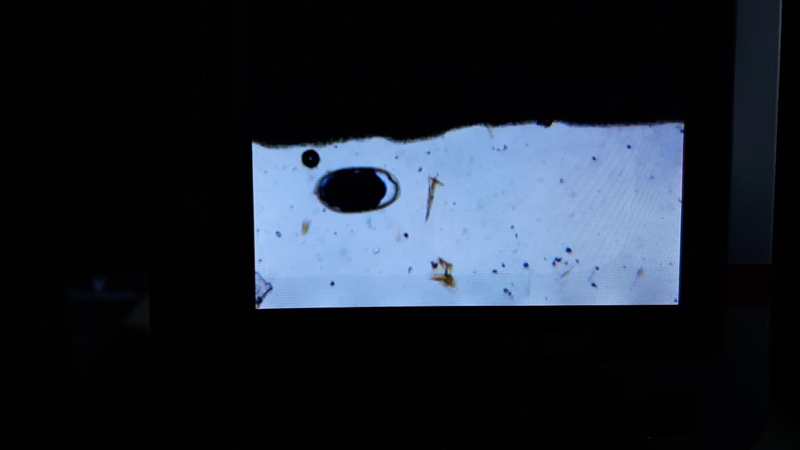 However, I found a single Nematodirus egg. This is a type of worm that can be quite bad for lambs to get so the ewes will need to be treated in the next coming weeks. Sunday, the day of rest right? Especially as it’s Mother’s day and a birthday? Well I was up at 8:30am and Sam stayed in bed until about 9:30am with Chi. Then it was all go again. The guy who owns the 0.5acre plot across the road has said we can graze the sheep there. It’s quite overgrown at the moment and the grass won’t be very nutritious so we’re going to send Anya and Aelin over there as they shouldn’t be pregnant and are being a bit of a nuisance to the others. 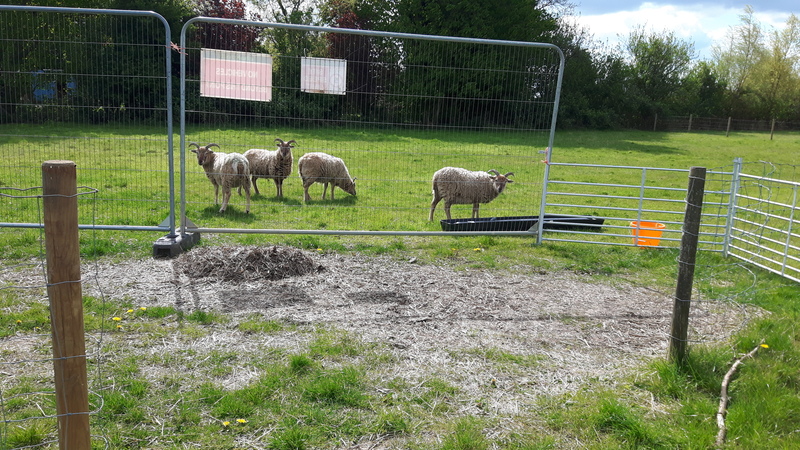 But there is a pile of rubble at the back and the guy goes in regularly to get bits from his storage container so we’ve bought heras panels so that they sheep are safe and he can get to his stuff. They arrived bright and early so that was the first job. Our next job was to finish marking out the berry patch. We marked out the blueberry row a little while ago and got some planted. We marked out the rest of the spots and cleared more of the area but there’s more moss and grass to clear and then of course the bushes to plant but I can do that on my own. Thankfully of the 31 fruit bushes we bought at our local garden centre it looks like 30 have made it through the winter and are budding. I’m holding out hope for the last one but we will see. They varied in price from 50p to £2 so pretty good value. Next we had an impromptu chicken rescue. Aurora had got into the goose area and one of them went for her, judging by the squawking and honking I heard. I ran over to check she was ok and found her on the other side of the fence, on the bank of the drainage ditch that runs along our smallholding. There’s chicken wire along the bottom so she would have had to fly back over. I ended up climbing over the fence and trying to catch her on a steep bank. That was not fun but we got her back safe and sound. No rest for the wicked, a quick drink of squash and we were back to work. We pulled back the weed proof fabric that we spread over the intended veg bed. It was much better than it had been but some bits were still growing. We dug out some of the bigger stronger tufts of grass, raked the area to be somewhat level, flattened out the fabric and marked out the veg beds. We’ll plant through the fabric this year, then in the winter we will pull it back again, mark out the beds top with well rotted manure. Or at least that is the plan. We’ll see how it goes. Fabric rolled back, pegged out and beds marked with canes. The clocks going forward meant that it was still light out so we headed across the road to start putting up the heras panels. We managed about half before Chi woke up and we had to head in for dinner whilst Sam saw to the animals. For the last job of the day Sam went to get a combination of Chinese and Indian for dinner whilst I baked him a birthday cake. It was an experimental apple and redcurrant cake. I thought I used enough redcurrants but they are quite subtle so I think I’ll double amount next time. With all the stuff getting done, the plants growing, the buds on all the trees, the sheep getting bigger and all the eggs rolling in it really feels like the year is turning. PS We have a new like button on our posts, you no longer have to sign in to wordpress to like things! So if you liked the post then click the button. And if you’d like to catch all of our posts there’s a subscribe box on the left if you’re on desktop view or at the bottom if you’re on a mobile device. Another long gap between posts. I’ve been updating the facebook page at least weekly with little things but to be honest it has felt very quiet on the smallholding for the last month. Not much has been going on, but as the blog has been mostly focusing on apples recently (or at least it feels that way! ), I’ll try and give you an update on our livestock. We plodded along with the bird flu restrictions hoping that they would be lifted at the end of Feb. Unfortunately the news came that they would only be partially lifted. Contact with wild birds must still be prevented but in low risk areas, like ours, birds can still be let out. There are a bunch of extra precautions that need to be followed, including use of things to scare wild birds away, keep feed and water under cover, making regular visits outside to scare wild birds and doing a full risk assessment. We had hoped to be ready to let the birds out at the start of March but we had a bit of a nightmare with some guys chopping some trees down for us. The job was quoted as 2 days but has taken 6 days spread over 3 weeks and we have now told them we’ll finish it ourselves. It took the plans for release right off the table as the felled branches littered everywhere and moving around our (very) smallholding became difficult. We did finally manage to let the geese out earlier this week though. 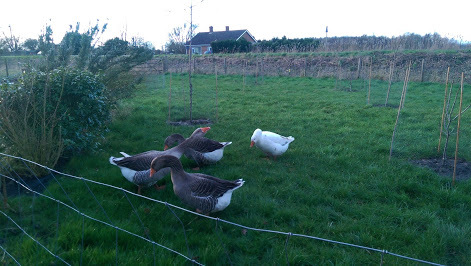 We cleared the branches from thier orchard, re-sited thier house (which Storm Doris tried to do roly polys with), fenced off the trees that wild birds can roost in and made enough of a path to walk the geese around. 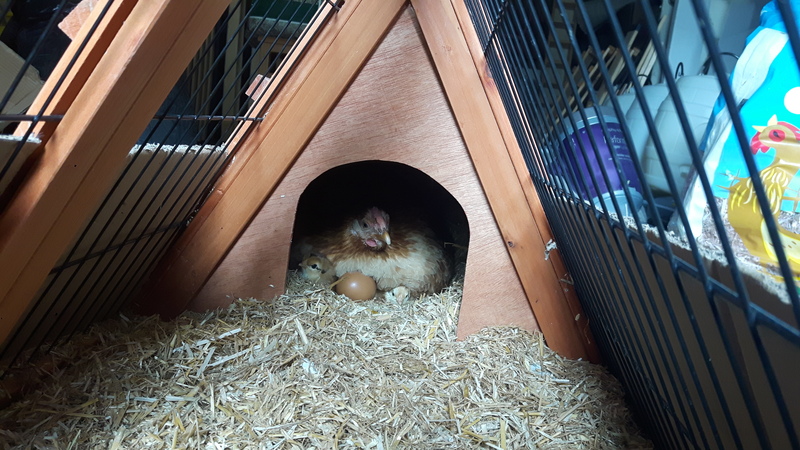 They were very happy to be out again and have even started laying inside thier house which is a first. Last year they were insistant that laying in the bush was far better! I want to get some more cds up to act as bird scarers but we’ve not spotted any wild birds in there and all the food and water are undercover. 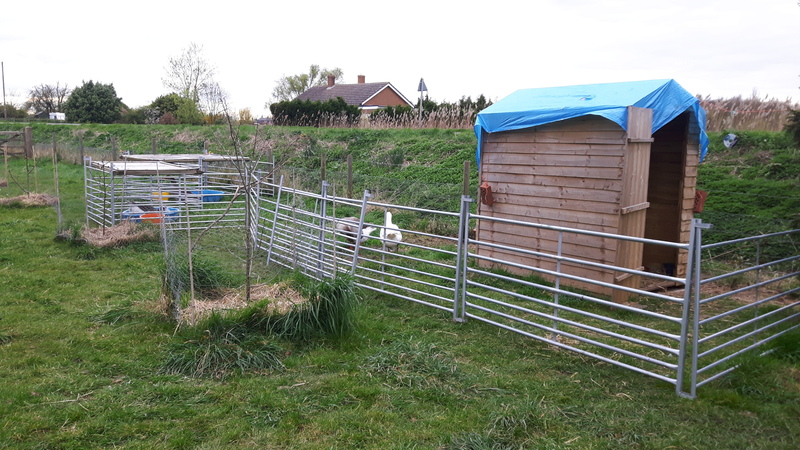 Our next couple of jobs for the geese centre around thier ‘house’ and include sorting out the roof, cutting the door in half, adding some ventilation and painting it. Fingers crossed I’ll have some pictures of a swanky new goose house soon! 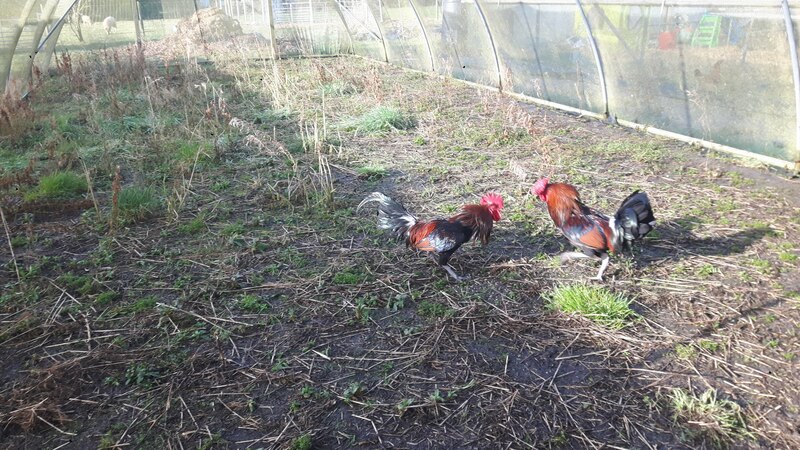 The chickens have been getting by in thier enclosure but they were longing to be outside. Unfortunately thier area is harder to keep bird free as they have access to the area under the leylandi and too many pigeons roost there and poop on the ground below. The issue was that it was the leylandi that were being trimmed and the area below them was a mess and we couldn’t fence it until we cleared it. If the guys had finished the job when they said we would have let them out a lot sooner. In preparation for letting them out I installed a shower curtain in thier run. It’s a clear one, hung over the entrance to the where the food and water will be undercover. This should deteer the wild birds but allow our (brave) chickens through. 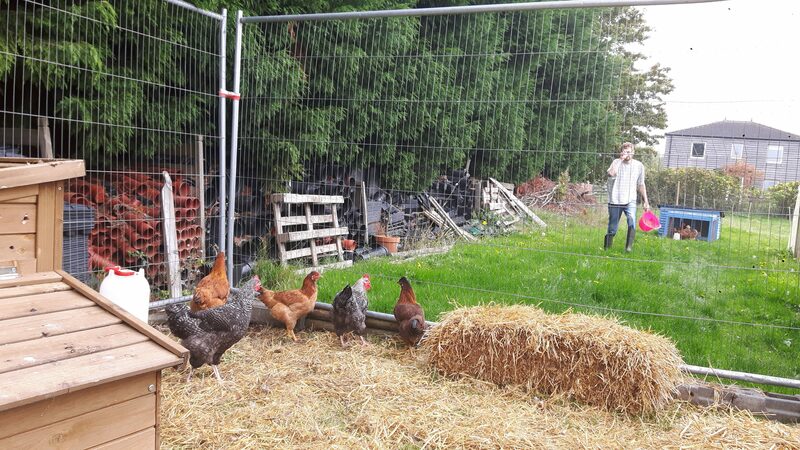 The chickens were a bit hesistant, especially Aramis, but they all go through it fine now. i also wanted to do a similiar thing for the pop hole, my first attempt at covering the pop hole failed though. 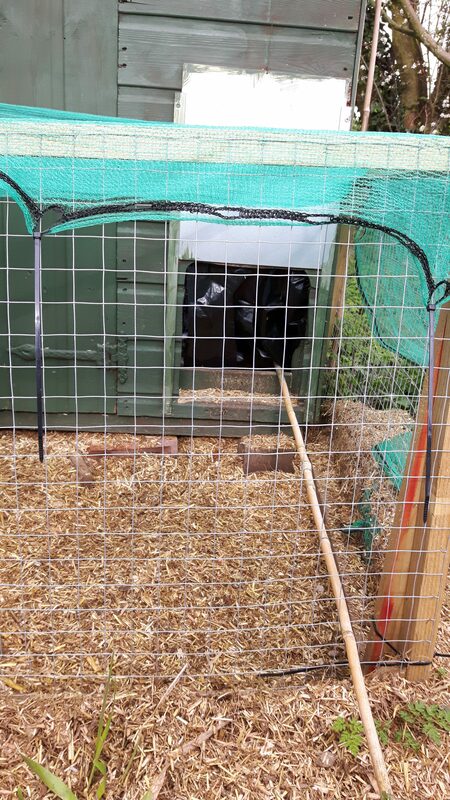 I used an old compost bag sack turned inside out as I thought the black would give more privacy inside and make some of the other nest boxes more appealing. 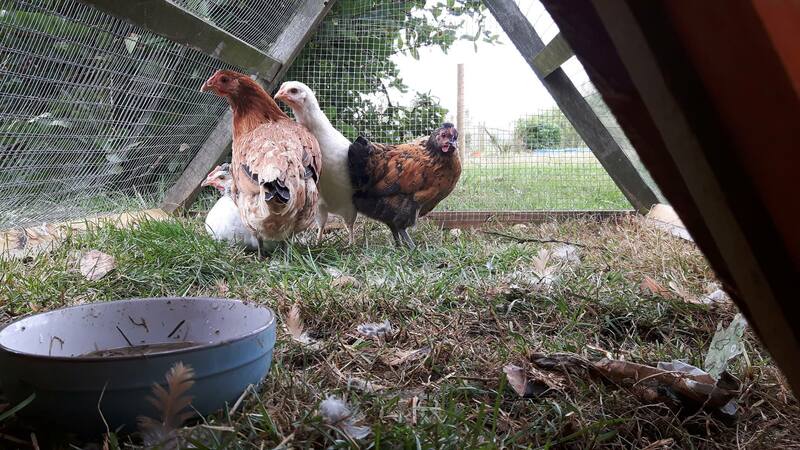 However, our chickens are a bit dense and pretty much refused to go through it either into the house or out. I ended up taking it down and putting up a clear feed bag. This went a little better although Sam still had to help 3 of the hens to bed tonight. A couple more nights of checking they have all made it to bed and we should be good. Unfortunately I only took a picture of my first attempt. We gave up on the idea of getting the leylandi fenced off and decided to claw back a bit of the garden for Chi. 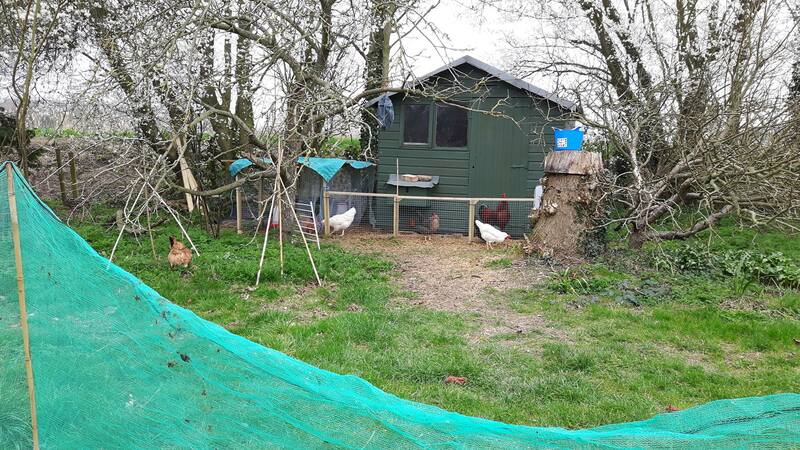 So we’ve halved the garden using bamboo canes and the scaffolding netting, which has given the chickens the ability to be let out again. Freedom finally! Two of the chickens tasted freedom slightly early though. We had to use the same scaffolding netting to fence the area off as we had used to cover part of the run. Buffy and Alice saw a chance and jumped over the panels leaving the rest of flock utterly confused as to how to get out. I’ll be getting some more bird scarer cds up tomorrow and then that’ll be their area done. 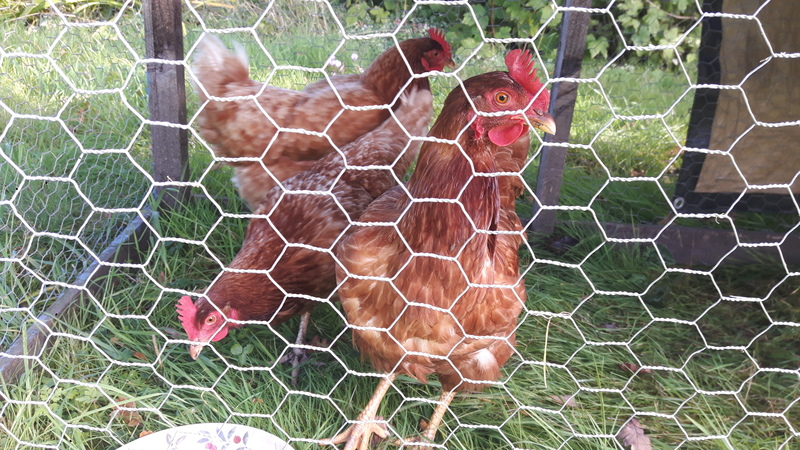 The hens had a great time scratching around for insects, whilst Aramis ran around like crazy mating with all the girls. All of the chickens are back in lay now. 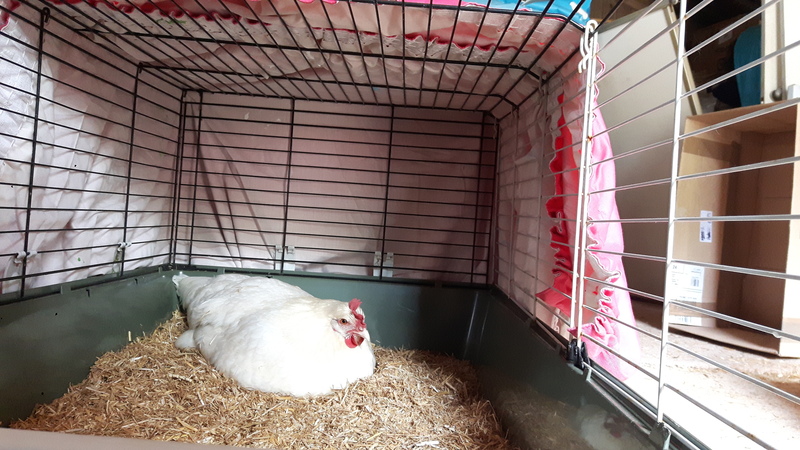 Brienne (our mixed breed hen from our first hatch) is laying large brown eggs whilst Buffy (our White Leghorn from our second hatch) has much smaller eggs but in a lovely white. Buffy’s eggs are starting to get a bit bigger though so I still hold out hope for the breed average of ~55g. So far Akira’s eggs have all been fine, we had an awful problem of ridged eggs from her last year. The only other thing of note is Awen. She was a bit off colour in the autumn and we even brought her into the house one night to perk her up. She has seemed better since the new year but now she has come into lay her eggs have been a lot smaller than they used to be, with only one normal sized. The other day we had the smallest egg ever from her, 22g. We thought it would be a wind egg (just egg white, no yolk) but it was a complete egg, just teeny. All in all the eggs are piling up so we’re going to have to start selling at the gate soon, hopefully by the end of the month. I just hope people stop to buy some! One of Akira’s ridged eggs from last year. I’ll try not to leave it so long before the next post, which I think will be an update on the sheep as you haven’t heard about them in a while. PS I was told that we needed a like button for our posts so waded through the mysteries of wordpress and we ‘should’ now have one. So if you liked the post then click the button. And if you’d like to catch all of our posts there’s a subscribe box on the left if you’re on desktop view or at the bottom if you’re on a mobile device.